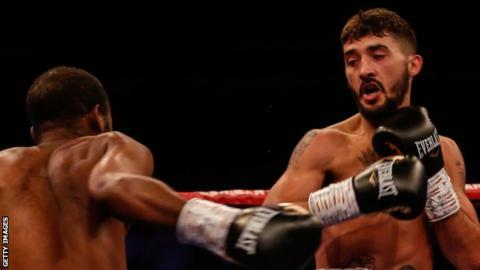 Welsh boxer Andrew Selby suffered a first career defeat as a professional as he was stopped in the fifth round by Julio Cesar Martinez in Mexico City. The 30-year old was hoping to become mandatory challenger for Charlie Edwards' WBC world flyweight title. Unbeaten Martinez had other ideas and a body shot in the fifth round did the damage with Selby answering the count only for the referee to intervene. Selby was ahead on the scorecards but must now pick another world title path. Wales' most decorated amateur boxer, Selby turned professional in 2015 and had been hoping to face Edwards, who successfully defended his title against Spain's Angel Moreno at the Copper Box Arena only hours earlier. Selby told BBC Sport Wales in the lead-up to the fight that he was concerned about the heat and altitude being factors and so it proved as he failed to maintain a fast start. A cut to his eyebrow in the third round appeared to rattle Selby with his opponent docked a point, and a left hook in the fifth stopped the contest - even though Selby's trainer, Tony Borg, felt the referee should have allowed his boxer to continue. Selby was ahead on the judges' cards, at the time of the stoppage, with WBC operating 'open scoring' for the fight, with their cards revealed after rounds four and eight. "He was hurt and he got up, the ref counted him out on his feet," Borg wrote on social media. Martinez is now the WBO's mandatory challenger for Edwards.